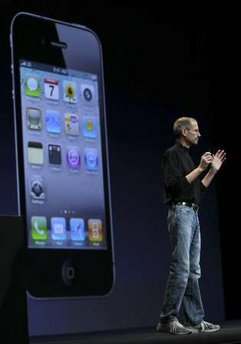 Apple CEO Steve Jobs stands in front of the new iPphone 4 during the Apple Worldwide Developers Conference in San Francisco, California June 7, 2010. Jobs fielded questions about it's new unwieldy size by repeatedly answering, "First you complain you can't hit the buttons with your fat little fingers, now you can't fit it in your car?" Jobs finally left the stage in disgust, muttering something about getting a latte with no milk.